Ancient cultural tradition of the Maori people of New Zealand hold that the great fisherman and mariner Maui caught a giant fish with a woven line and a fish hook carved from the jaw bone of his grandmother. The hook caught in the fish’s side, requiring it to be dragged ashore in Hawke’s Bay on the North Island of New Zealand. The Maori people call the North Island of New Zealand “Te Ika a Maui,” (The fish of Maui), so in acknowledgement of this tradition, the hei matau is an ornately carved hook that resembles the shape of Hawke’s Bay. It was always carved from whale bone, but with bans on whale fishing, they had to find alternative materials, such as green stone, cow bone, or even ground cow bone in resin. New Zealand law, however, allows the Maori the right to harvest the bodies of any whales stranded on the islands that are unable to be refloated. 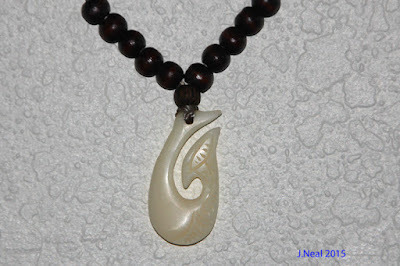 The significance of the hei matau is that it is considered a taonga, or cultural treasure, and is commonly worn as a necklace to honor both their culture and Tangaroa, the God of the Sea. It acknowledges their close ties to fishing, and is believed to show a great respect for the sea, and to insure safety while traveling on water. International trade has carried the hei matau around the world, so it is now seen elsewhere. It is supposed to carry particular significance when presented as a gift, so Jean purchased one and made a gift of it to me. The beads that I have added to the cord each represent 100 miles of paddling. Content, text, and pictures on this blog are protected and are not to be reused or published without the author's consent. Thank you.